Forget any poor imitations to this classic Jacob's biscuit. The Club Milk biscuit delivers not one but two delicious biscuits thickly covered in smooth, rich, thick chocolate. 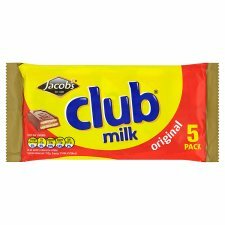 It you’re a nibbler, a dunker or a straight up muncher, Club Milk will fill that gap and leave you wanting more..... Pick up a pack today and enjoy this unique biscuit at home with a cuppa! Remember if you wanna have a cuppa have a Club!